A very controversial topic yet always kept under the rug. The inclusion of religious education started back in 1944. The objective was to explain the values and purpose of this sort of education. If we look around the world, we can find different countries will follow a different religion. That is what applied specifically in private schools. The religious-education is taking the front seat. The authorities of such schools find it important. They feel that this sort of education will help the students to be spiritually sound individuals. But the concept of “religious education” is facing a strong backlash from many people around the globe. They feel that it is an unfair practice for those children who don’t belong to the same religion. This results in solitary of the children or unwillingly they should follow the belief. In both the cases, it is the students who are suffering the most. Let us check the trends that are followed by different religion. As mentioned earlier, different religions have their own beliefs and rituals and hence that is the way they follow. Talking about the Islamism, the children are sent to the Islamic school- Madrasah Islamiyya. These schools teach the children to read and speak Arabic. Added to it, the preachers or the Mullas teach the students to memorize the suras in the Quran (a holy book). Similarly, talking about Christianity, the process of imparting religious education is known as Catechesis. The Church Educational System provides religious education to the youth across 145 countries of the world. Amazing isn’t!!! Not only these religions, but there are also other religions which accept that for the sustainability of the human race, religious education is an important aspect. These are Hinduism, Sikhism, and Jewish etc and practiced across the globe; let us now converge towards India. India is popularly known as the “Land of God”. From the ancient history, India had a very unique style of education, the “Gurukulas”. The concept of Gurukulas laid the foundation for modern day Boarding school. The students from different villages would join the Gurukulas to attain the supremacy. The legacy of religious-education started long ago. The gurus or the preacher felt that this sort of education will enlighten the young minds with divine knowledge. India has a lot of cultural diversity; this plurality causes atrocities and conflicts at the time. Talking about the schools, many private schools are run by the religious community which includes Hindus, Christians, and Islam etc. If we take a glance at the pre-independent era, we can figure out the number of Christian’s private schools. These schools were widely attended by the British and some Indians as well. And as per the records, some of them still exist. These schools used to teach academics based on UK standards but were accompanied by bhajan/kirtans, singing and whatnot. This type of religious education nowadays is imparted by ISKCON but in an informal manner. What we can draw from this? 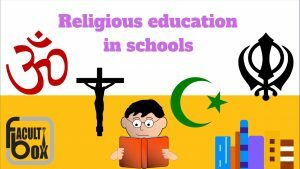 The religious education was always a part of the Indian Educational system, despite the fact that it is a Secular country. What an irony!!! The religious education as stated above, have started back in date. Those were the era when religion played a very crucial role in an individual’s life. What was the purpose of such education? The sole purpose was to develop human values. This was based on the beliefs and rituals followed by every religion. Religion was considered to be the pivotal point through which the social evils could be eradicated from society. This could have been followed only if the essence of religion was taken in liberal sense. Why things went wrong? This is due to the conflict of interests of different religion. The communal forces always make use of such sensitive issue and destroy the harmony of the nation. The political party just for their vote bank will create differences among the people. This results in conflicts and chaos all over. The entire essence of the religion has been hampered by inhumane activities. The nation wants to know, why religious education in school curriculum came into the picture if Article 28 already existed. According to Article 28 (1), “no religious instruction shall be imparted in the state-run institution maintained by government-funding”. Why? If there is a need for religious education, why can’t the government monitor those institutions? It is very well known that India is a secular country but the secular ethos is not followed correctly. There are many schools in India where under the obsession of religious education, students from vulnerable communities are discriminated. The religious education was included to enhance the human values not defaming it. Re-iteration of the educational system is necessary. Stop the nation from falling prey to the communal powers. A strong curriculum is required which portrays equality for every religion. On the verge of decoding the meaning of religious-education, do not change the soul of it. A passionate content writer with an exposure of marketing strategy. Having Bachelor’s in Electrical and Electronics, she recently completed MBA in HR and Marketing. Working as a Business Development Manager in FacultyBox, No. 1 Faculty Recruitment Portal.